I am guilty of going to Starbucks way too much during the holidays, because I LOVE eggnog lattes. I have been loving the Holiday Spice Flat White though. Which holiday drink is your favorite? So, since I love their drinks so much I decided to try making my own. You don't need an espresso machine for this, but if you do have one then that's great. It helps to have a milk frother for this recipe, but I know that some people use a blender or a whisk to get that super frothy milk. Either way will work. Also, use some good quality, freshly ground coffee beans for this. I used Stumptown because their coffee is heavenly. In a small pot over medium heat, add the milk and eggnog. Heat the mixture until it is steaming and just starting to bubble, then froth the mixture using a frother, whisk or blender. Try to get the mixture to double with froth. 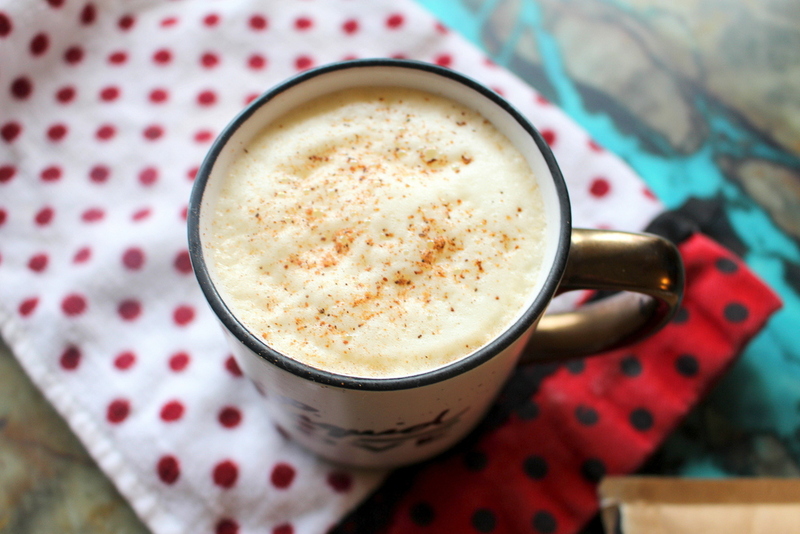 Pour the coffee/espresso into a mug, then add the eggnog/milk frothed mixture. Garnish with ground nutmeg and enjoy.